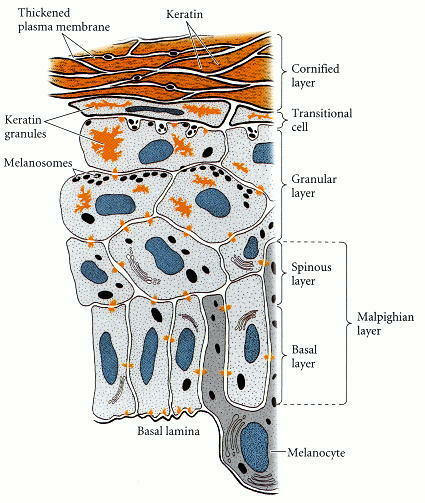 Melanosome are tissue-specific lysosome-related organelles of pigment cells in which melanins are synthesized and stored. Electron microscopy analyses of MNT-1 human melanoma cells fixed by high-pressure freezing before cryosubstitution and embedding. The four stages of melanosome development are shown in the upper panels. Note the dense bilayered coat (arrowhead) and intralumenal vesicles (arrow) of stage I melanosomes, the proteinaceous fibrils (arrow) of stage II, and the melanin deposition (black) in stages III and IV. The main panel shows a typical field of MNT-1 cytoplasm near the nucleus, which contains all four stages of melanosomes. M, mitochondria; N, nucleus. Scale bar represents 0.5 m.